Call this one a combination of two Illustration Friday themes - this week's "Burning" and last week's "Afterwards." Normally, I don't post complete comic pages - they have a tendency to later turn up in places I didn't intend or give permission for. This piece was drawn immediately after the "Black Saturday" fires last year and was particularly my reaction to the loss of Marysville at the time. Somehow I wanted to express sympathy for the devastation there - the loss of property and lives - but also to render my concern for the loss of a particular species, the Leadbeater's possum, that had been incompetently handled by the logging industry, government and conservation alike. There was potential for a much longer piece and I had plenty of ideas, but I don't think I wanted to draw it. hi - thank you for your nice comment! 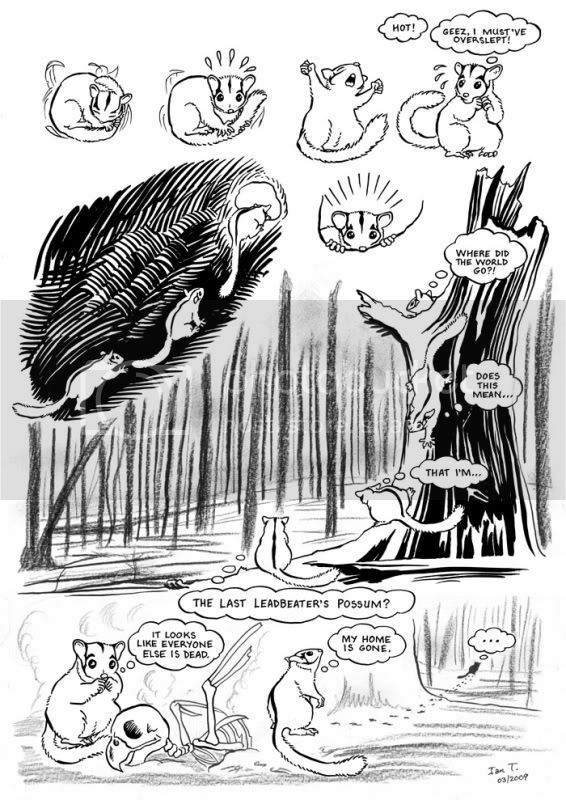 this story is very nicely drawn & told but im quite intrigued as to what will happen to the poor possum...hope he will manage alright! Wow! This is great Ian! I love your use of black and white! Great possum and terrific post! I love the story! and the drawings too!very interesting post! Great comic, adorable, touching, poor little thing, so nicely drawn. I love seeing people's comics. weird? my comment didn't connect last night? Excellent piece! Poor little guy. This makes quite the statement. I love your lines, and his pose (when he says "My home is gone") is wonderful. really amazing piece, Ian...i especially love the way you handled the starkness of the trees. It's a shame that we as humans destroy habitats w/little concern for the nonhuman species that live there. I have no doubt we will pay a heavy price for our disregard...thank you for shedding light on this issue with your art.